Ferrari says it is recalling 1,248 of its 458 Italia supercars after reports of fires breaking out in five of the luxury vehicles in several countries. The Italian carmaker said Thursday it wants to replace an adhesive that in some circumstances can melt due to overheating and possibly ignite. 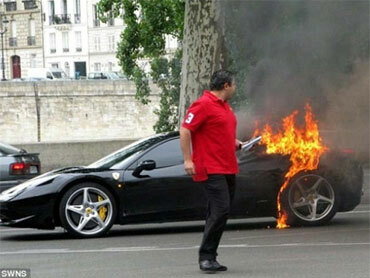 Fires in the car that sells for euro197,000 ($253,000) have been reported in California, Switzerland, China and France. Ferrari spokesman Stefano Lai says the company will be asking the owners of 1,248 cars produced before July 2010 to bring them in to have the glue replaced with mechanical fasteners. The 458 uses technology developed by Ferrari for its Formula 1 racing efforts, reports CNET. Winglets around the grill are designed to deform as speed increases, covering portions of the grille to reduce drag. The car has a seven-speed dual-clutch transmission -- the F1 type that Ferrari has been offering in the F430 and 612 Scaglietti. Other race technology appears in the form of the electronic rear differential, which is integrated with Ferrari's traction-control system, resulting in a claimed speed increase of 32 per cent coming out of corners.